A soggy course and howling winds greeted runners as they competed last Saturday in the Central Jersey Group 4 cross country sectional at Thompson Park in Jamesburg. 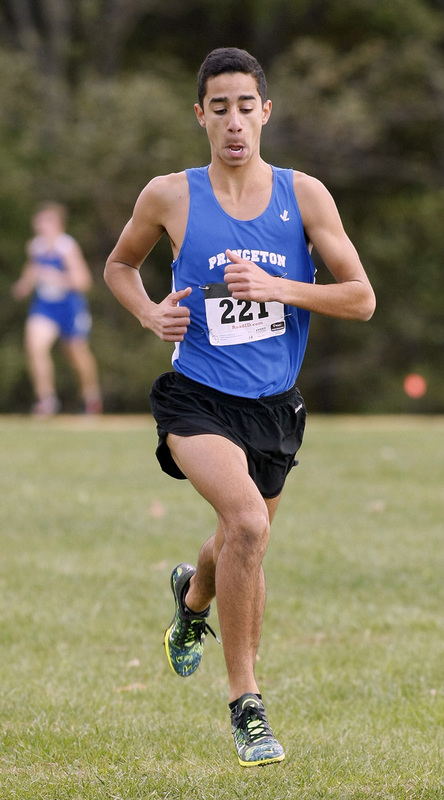 Proving that he is a tough mudder, Princeton High senior star Acasio Pinheiro flew over the 5,000-meter course in 16:07.4 to place first individually, five seconds ahead of runner-up Nick Lundberg of Freehold Township. Pinheiro’s heroics helped PHS finish second in the team standings behind champion WW/P-South and advance to the state Group 4 meet this Saturday at Holmdel Park. “Acasio made some smart decisions,” said PHS head coach Jim Smirk, noting that Pinheiro didn’t run in the county meet on October 26 due to injury. Smirk credited Pinheiro with rising to the occasion in producing his winning effort. “We always knew that Acasio had that kind of potential; he is an incredibly talented athlete,” said Smirk. Another PHS senior, Tucker Zullo, was up to the challenge at the sectional meet, placing sixth in 16:36.1. The Little Tigers also got a strong effort from senior Jackson McCarthy, who took 12th with a time of 16:58.4. Junior Tyler Fu worked hard to get himself in a good position, placing 30th in 17:23. “Tyler was in a situation early in the race where it went out pretty quick; it would have been easy for him to panic. Instead he just stuck to his race plan and made the race when it counted,” said Smirk. The fifth finisher for PHS, sophomore Jacob Bornstein, worked his way through the pack to take 56th in 17:55. The PHS girls’ team didn’t hit the gas at the right time, taking seventh in the team standings in a meet won by South Brunswick with senior Siena Moran leading the way, finishing 12th individually in 20:02.3. Smirk praised Moran with sacrificing for the team. “Siena could have been more conservative, but there would have been no chance for our tram to get ahead,” said Smirk. In the meantime the PHS boys’ squad will be gearing up for another battle with South at the Group meet. “South has an incredibly veteran squad, very deep and Adhwin (Sridhar) had a great day for them,” said Smirk.